Price is per 16-inch strand of these beautiful beads. Each measures 10mm x 10mm x 4mm - about 40 beads to the strand. Mystery surrounds moonstone. In India it’s considered sacred to lovers, and is also known as a “dream stone” bringing beautiful dreams. In Arab countries women sometimes wear moonstone as a symbol of fertility. It was also believed to be especially protective to seafarers, who have used it since ancient times. During full-moon, moonstone is very powerful for reconciling love - and as the moon decreases, is said to allow one to foretell the future. Classical moonstone from Sri Lanka shimmers pale blue, and is now rare, so expensive. Moonstone from India has a cloud-like play of light on beige, brown, green, or orange backgrounds – and some have a cat’s eye or a multi-layed star. Natural uncut moonstone is dull without the play of light, which is brought out by the cutter’s skills. 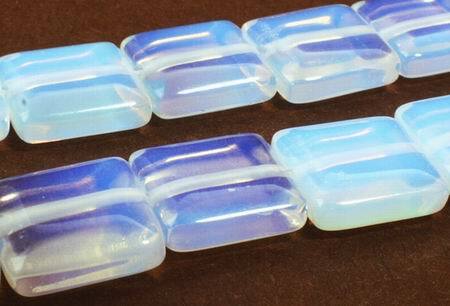 Classical moonstones are always cut as cabochons.